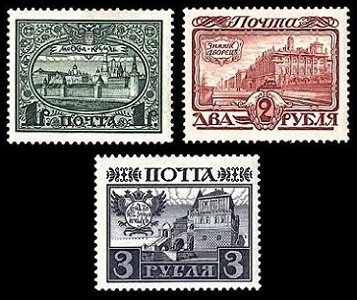 The first commemorative Russian stamps, honoring the Romanov Dynasty, were issued in January 1913. It was a time of great jubilation, but all was NOT well. Russian involvement in World War I, combined with the suffering and poverty of the Russian people, would trigger a cataclysmic revolution. Within less than four years, both the Romanov Dynasty AND the Russian Empire would be history, and the factions of the former empire would be embroiled in a civil war that would rage on for yet another five years! The sheet watermark shown above, was used for stamps of the Russian Empire between 1857 and 1906. WMK 168 goes across the sheet, so an individual postage stamp will show only a portion of the watermark. 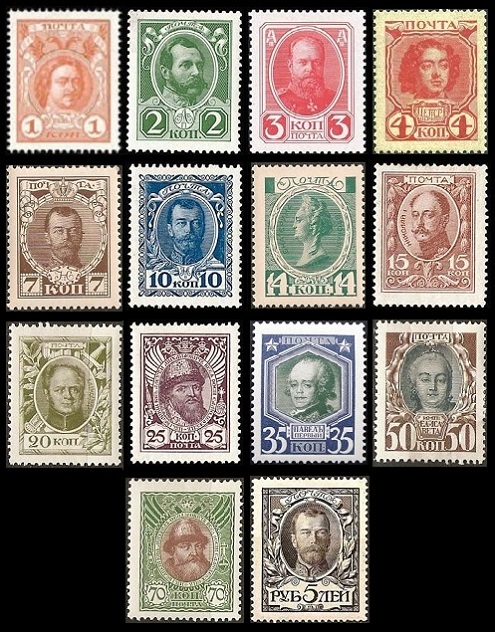 The seventeen commemorative Russian stamps shown above were issued on January 2, 1913 to celebrate the 300th Anniversary of the Founding of the Romanov Dynasty. The Kopeck denominations are typographed, and the Ruble denominations are engraved. All the stamps are perforated 13 1/2. The 1 K., 3 K., 7 K., 10 K., 2 R., and 3 R. denominations also exist imperforate. 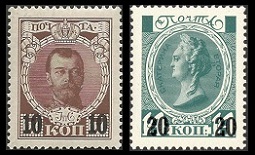 The three Romanov Dynasty type Russian stamps shown above were issued in October 1915, due to a coinage shortage. These "stamps" are printed on thin cardboard, and they were issued to be used in the place of coins. The reverse of each of these "stamps" has the Imperial Arms and a five line inscription meaning "Having circulation on par with silver subsidiary coins". 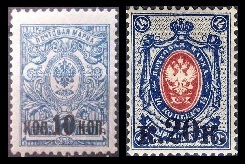 The high-denomination-type Imperial Arms Russian stamps shown above were re-issued in 1915. These stamps have vertical lozenges of varnish on the surface. 05.00 R. (1915 - Sc. #108) - Dark Blue, Green, & Pale Blue; Indigo, Green, & Light Blue. 10.00 R. (1915 - Sc. #109) - Carmine Lake, Yellow, & Gray; Carmine, Yellow, & Gray; Rose Red, Yellow, & Gray. 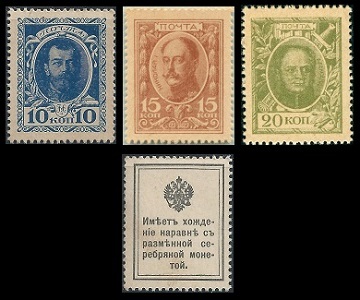 The two Romanov Dynasty type Russian stamps shown above were overprinted and re-valued in 1916. 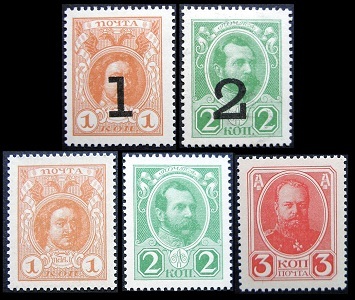 The five Romanov Dynasty type Russian stamps shown above were issued in 1916 and 1917, due to a coinage shortage. These "stamps" are printed on thin cardboard, and they were issued to be used in the place of coins. The reverse of each of these "stamps" has the Imperial Arms, the value, and a four line inscription meaning "Having circulation on par with silver subsidiary coins". 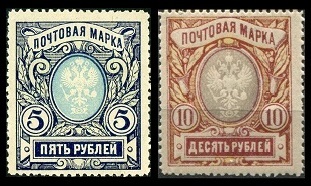 The two Russian stamps shown above were overprinted and re-valued in 1917. 10 K. on 07 K. (1917 - Sc. #117) - Light Blue. 20 K. on 14 K. (1917 - Sc. #118) - Blue & Rose. For anyone seriously considering specializing in the stamps of Russia or the Stamps of the Union of Soviet Socialist Republics, a specialized catalog is required. 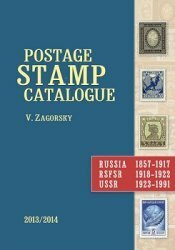 The Zagorsky catalog is the specialty catalog for Russian philately, and the more recent editions are published in English! Click on the picture above for a link to ordering information on the Zagorsky website. These catalogs are also frequently available on eBay. Here's a link to the proper eBay category.